Author: Misa Tamura, Research Conservator with contributions from: Beth Knight, Aisling Macken, Marika Kesler, and Megan Creamer, first and second year students, MPhil Textile Conservation. As part of Situating Pacific Barkcloth Production in Time and Place project interventive conservation work and re-housing have been carried out for Pacific, chiefly Polynesian, barkcloth collections from the Hunterian Museum, University of Glasgow and Economic Botany Collection, Royal Botanic Gardens, Kew. Both collections encapsulate historical practices of barkcloth production in Polynesia. Although several barkcloth items from the Economic Botany collection were conserved by former TCC/CTC students, many of them have not been conserved, possibly since their acquisition by the respective collections. Several of these untreated cloths were severely deteriorated or stored in an inaccessible way, making it difficult for the potential interested groups such as researchers and contemporary barkcloth practitioners to access the collection despite the wealth of research values that the collections could offer. I estimated over 3500 hours of conservation work to stabilise and re-house the objects from the two collections. As an extra-curricular activity, 12 students from the MPhil Textile conservation programme volunteered to assist me in all aspects of the conservation programme, such as condition assessments, conservation documentation, photography, interventive treatment and production of custom-made storage solutions. The project benefits enormously from their assistance with carrying out the conservation programme effectively and in timely manner. 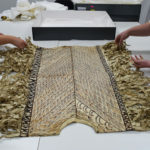 It is also an opportunity for the volunteers to gain in-depth knowledge and first-hand working experience with the Pacific barkcloth, rather unusual materials, nonetheless one they might encounter in museums in future. They bring the new skills and knowledge that they learnt from the course and apply them effectively to the conservation of the barkcloth. © University of Glasgow, courtesy of The Hunterian, 2017. 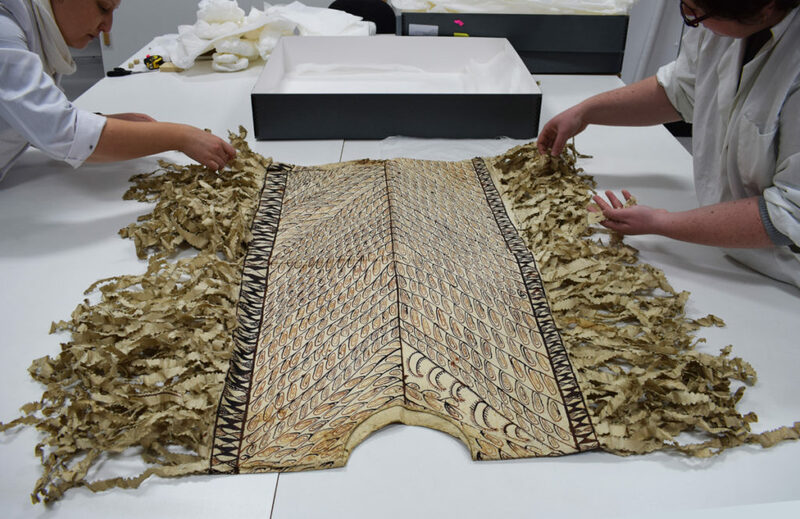 Volunteering has been a fulfilling way to directly contribute to preserving Glasgow’s heritage collections through treating the barkcloths from the Hunterian Museum collection that span the Pacific. Each object is unique so we are constantly learning about different decoration and production methods, which are sometimes revealed through our treatments. This was the case for a small soiled and creased barkcloth (pictured below) with an unusually thin, crumpled edge. The ingrained red pigment on this barkcloth could be ochre, a historic soiling that can provide clues about the barkcloth’s provenance and is therefore essential to keep on the barkcloth unlike the potentially harmful modern soiling that I had to carefully and selectively remove. Creases can also weaken a barkcloth. The crumpled edge slowly opened as I humidified it to reveal a thin flap of barkcloth. This flap indicates it is an outer edge, and scissor cuts on the opposite edge suggest that it may have been cut from a larger barkcloth. The final step was creating a custom storage folder to support the petite barkcloth. A few weeks before, we learned how to make recessed padded boards in our course so I was thrilled to put these skills into practice. After treatment, the barkcloth was more stable, easier to examine, and had exposed some intriguing clues about its past. My classmates and I usually work collaboratively to treat much larger barkcloths, but the necessary treatment techniques and observational skills are much the same. 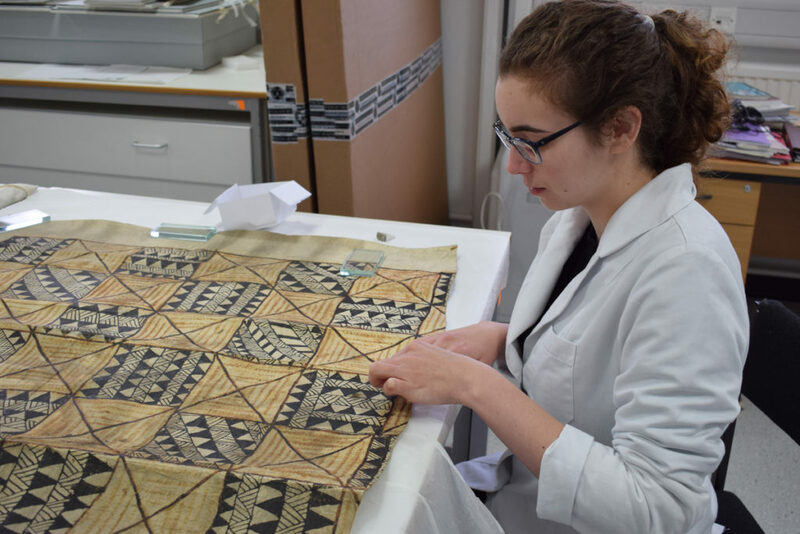 Volunteering with the barkcloth project exposes us to different materials and treatment approaches that encourage us to grow as conservators in training, and I am grateful to help preserve these fascinating objects. GLAHM: E.596/6 after treatment. © University of Glasgow, courtesy of The Hunterian, 2017. Marika and Megan untangling fringes of a barkcloth garment during the condition assessment © University of Glasgow, courtesy of Royal Botanic Gardens, Kew, 2016. My week-long volunteering in December focused on condition assessments for the Kew Gardens collection that had just arrived at the CTC from London. The diversity of textures, weights, and even sounds and scents of the Kew Gardens objects made for an entirely new, and fascinating experience. 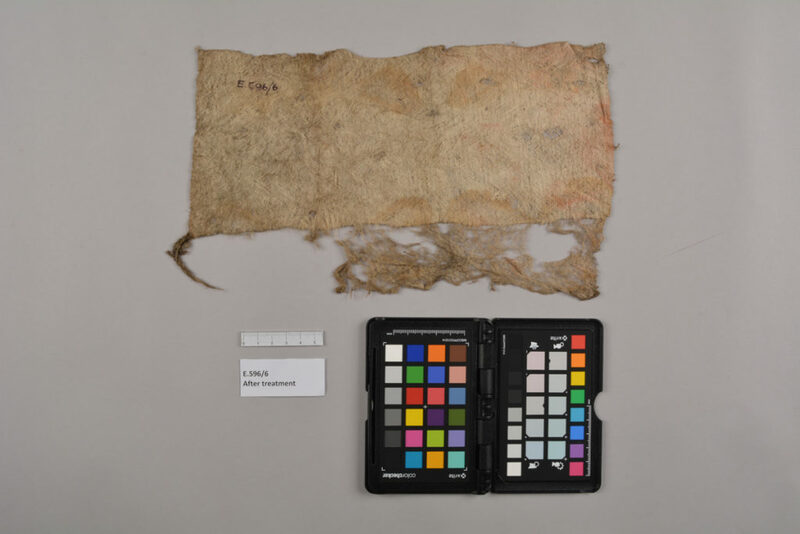 Under Misa’s direction, we assessed dozens of bark cloth objects from across the Pacific to document condition. We looked methodically at size, shape, texture, patterns, and materials, while thinking critically about conservation needs and final storage. It was an excellent way to put the skills from my first semester at the CTC into practice, while also getting an intensive course in bark cloth as a material with limitless variations. I look forward to seeing some of my personal favourite Kew objects again as I continue volunteering for the spring semester. While it may seem unconventional to be excited to keep on working over Christmas break, getting to help with the condition assessment of the Economic Botany Collection, Royal Botanic Gardens, Kew was, if you will forgive the cliché, a wonderful voyage of discovery. As a very hands-on type of learner, helping with this project allowed me to learn the methodologies and techniques developed by a seasoned conservator. In exchange, she got an extra pair of hands to help lug cardboard and unpack bark cloth much too large to safely unfold alone. Not only was I receiving valuable work experience, but I got to discover century-old handwritten notes about the cloths, and to listen to Misa recount the voyages of the people and their ships that travelled the world. I even felt a connection through the travelling pieces and their collectors to my family in Fiji, who I’ve never been able to visit. Every day Misa thanked us generously for our time, but I’m sure we got as much or more for hers. 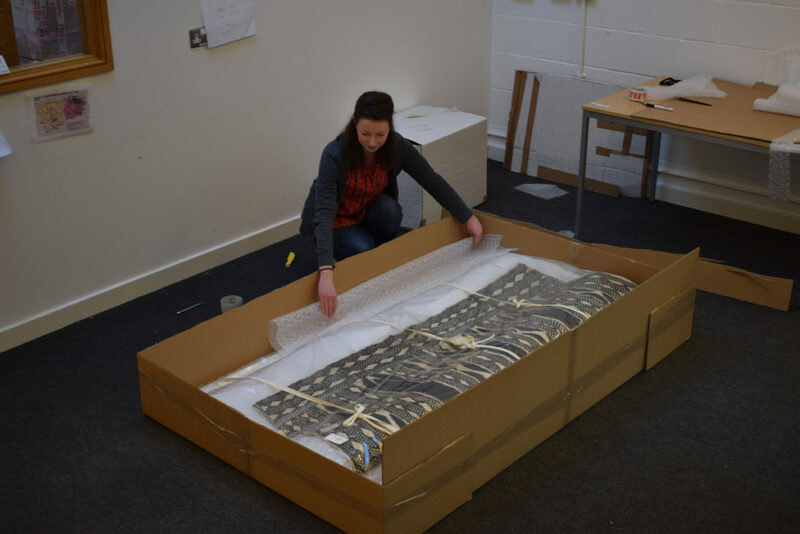 Aisling packing a large barkcoth from Economic Botany Collection for its transport to Glasgow.© University of Glasgow, courtesy of Royal Botanic Gardens, Kew, 2016. Working alongside project research conservator Misa Tamura this past December at Kew Gardens afforded me a fantastic chance to see another side of the conservation profession. Misa and I were in London for three days to pack approximately forty items from the Economic Botany Collection for transport to the Centre for Textile Conservation for study and conservation. Packing textiles for transport differs greatly from packing objects for storage, as the objects needed to be packed with layers of bubble wrap, Jiffy polyethylene foam and acid free tissue, to ensure a tight (but not crushing) fit within the transport box. Given the fragile nature of some of the barkcloth belonging to Kew, this was especially important, and turned out to be more of a challenge than I expected it to be. However, with patience (and a lot of packing tape) Misa and I successfully ensured the safe travel of some truly spectacular barkcloth objects.